Boulder Bowl’s newest owners say they scored pretty high with their move to Boulder City and purchase of the historic bowling alley. Boulder Bowl, which first opened in 1947, was purchased by California couple Diana and Lonnie Cavins in May 2012. 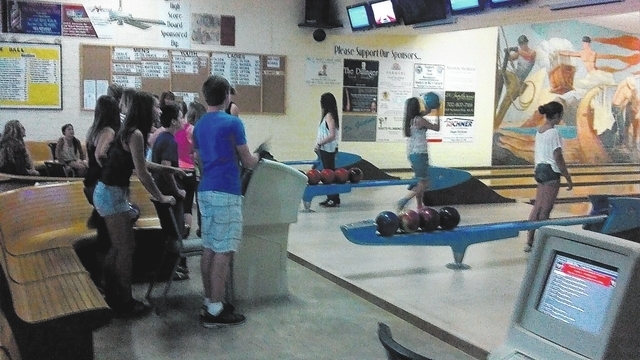 The couple said their plans to increase the bowling alley’s popularity by reaching out to local youths, extending bowling hours and investing in the facility have succeeded. Over the summer, Boulder Bowl participated in a national program called Kids Bowl Free.The program gives students two free games every day during the summer and allows teachers to apply for grants that pay for classroom supplies. Boulder Bowl is Southern Nevada’s only privately owned stand-alone bowling center and the only bowling alley that participated in the program. Other bowling alleys are connected to large hotel-casinos or smaller casino-bars. “It’s a very expensive program for (Boulder Bowl) to run for the benefit of the kids,” said Don Smale, a local bowler who assists with Boulder Bowl’s marketing efforts. But Smale, who also coaches a youth bowling club at Boulder Bowl, said the Cavinses have been “ridiculously” supportive of youth bowling. When he approached them in the summer of 2012 to ask about starting a club, the new owners not only supported the club, but offered to give the kids a special rate of $5 for two hours of bowling. In the year since his club began, Smale said it has tripled in size from four bowlers to 12. “They’re some of the nicest people I know,” he said. The Cavinses, on the other hand, are enthusiastic about what the next generation has to offer. “We got some really good high schoolers, where if they stay at it, they’ll be professional,” Lonnie Cavins said. Since taking over, the couple also extended the bowling alley’s hours; it’s now open 12 hours a day, from 9 a.m. to 9 p.m., seven days a week. “We try to keep it open as much as we can,” Lonnie Cavins said. Landlord Charles “Pepper” Coombes said he is pleased with the effort the Cavinses have put into the business. In 2011, with the former bowling alley owners Steve and Chris Osborne planning to retire and close the bowling alley, Coombes purchased the building from its Reno-based owner for $200,000 and worked out a deal that would keep the lanes open until a new operator was found. Coombes, who frequented the bowling alley as a teen, said in 2011 that his only motivation was to keep the historic bowling alley open, because if it closed he felt there would never be another bowling alley in town again. The Cavinses’ passion for the bowling alley is born out of their passion for the sport. Diana Cavins has been bowling for nearly 50 years, and her husband managed two pro shops in California. Since buying the business, they have put their “heart and soul into it,” Diana Cavins said. They’ve also put their money into it, investing more than $50,000 in improvements including disco lighting and new lanes. The couple said they’ll never make back the amount of money they have invested in the facility, but they still call the venture a success. “We gave up a lot to come here. We didn’t come here to fail. That was not an option,” Lonnie Cavins said. Reporter Jack Johnson can be reached at jjohnson@bouldercityreview.com or 702-586-9401. Follow on Twitter: BCReview.